Throughout his career, there's been a common thread: how much Jim Beilein prepares his team through the use of video. In an age of fast-moving and constantly changing technology, this Michigan team is the beneficiary of Beilein's most advanced video training. "He's obsessed with it," junior guard Manny Harris said. "We watch it every day. You come from class, walk by his office and he'll say, 'Come in; I want to show you something.' I honestly think he wakes up at 5 a.m. and looks at tape -- probably earlier than that." Indeed, Beilein usually sets aside an hour in the morning to watch at home, so that when he comes into the office, he already has not just watched tape of a practice or a game, but also edited it down for a digestible 20- to 30-minute hit. "I don't want any distractions, nothing; I just watch it," Beilein said. "I don't have to watch and then come tell someone to cut it. I just cut it and then I'll watch my cuts again." Video coordinator Matt Duprey has simplified Beilein's laptop icons to make it easier for him to use. Duprey is almost like Kramer on "Seinfeld." 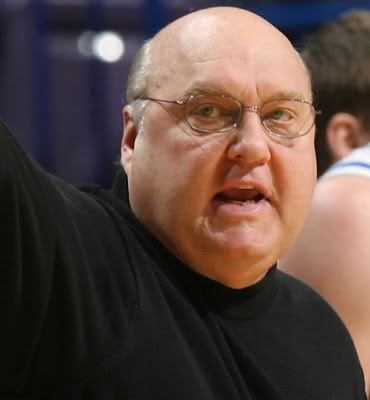 If Beilein yells from his office for help with a program or an edit, Duprey comes bursting through the door. Maybe he's not as animated in his entrances as actor Michael Richards, but he doesn't hesitate when summoned. "He's always here," Beilein said. "I caught him going to the bathroom once. It really pissed me off." 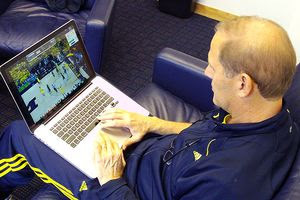 The computer program allows Beilein to have every practice and game on his laptop as soon as it concludes. This is nothing new to most coaches. But the difference may lie in how hands-on Beilein has become. He has one key on his laptop that starts and stops an edit, and he makes the cuts, over and over again. "If a kid is in a shooting slump, I'll clip one of him making a shot 10 times so he goes out on the court thinking he made 10 in a row," Beilein said. As Beilein was watching last Tuesday's practice, he was cutting a sequence in which freshman Eso Akunne moved toward the top of the key and then correctly bounced a pass toward the streaking Blake McLimans, a fellow freshman. But the timing was off. So he cut the video to show the movement first, which was correct, and then the timing of the pass, which was not. The spacing was off during the possession from other players, too, and that was made as a cut as well. The team watched roughly 40 minutes of video before each practice last season, Beilein's second with the Wolverines. Now he's down to about 20, since this is more of a veteran group and he has refined his own video technique. To my Friend and Mentor -- the best of wishes on your Birthday! Offensively assume that every shot is a miss. Send 4 to boards. Defensively assume every opponent is a terrible shooter. Send all 5 players to make physical contact. 1. Fingers spread wide and straight up when holding the ball. 2. Elbows are held straight out in both directions. 3. 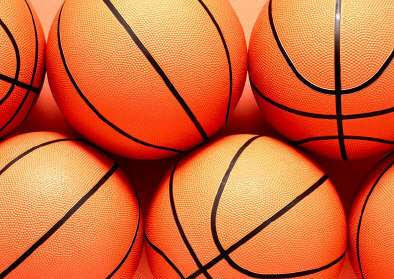 Try to squeeze the basketball. 1. Rebound with two feet with two hands. The following comes from our Hoop Boost site which is dedicated to players. If you haven't visited it yet, take a look and share it with your team. We don't post nearly as often at Hoop Boost, probably about twice a week but all the information is geared towards motivating players. 1. Puts others ahead of her own agenda. It means intentionally being aware of your teammates’ needs, available to help them, and able to accept their desires as important. 2. Possesses the confidence to serve. The real heart of being a good teammate is security. Show me someone who things she is too important to serve, and I’ll show you someone who is basically insecure. Just about anyone will serve if compelled to do so. And some will serve in a crisis. But you can really see the heart of someone who initiates service to others. Good teammates don’t focus on rank, position or playing time. The desire to be a good teammate is not motivated by manipulation or self-promotion. It is fueled by love. In the end, the extent of your influence depends on the depth of concern for others. "Teaching is the most wonderful profession. The most important professions in the world are parenting - that's the most important - and teaching." "Success all begins with attention to, and perfection of, details. They usually accompany success." "Big things are accomplished only through the perfection of minor details." "Set your compass in a chosen direction and then focus your attention and efforts completely on the journey of preparation. A successful journey becomes your destination and is where your real accomplishment lies." 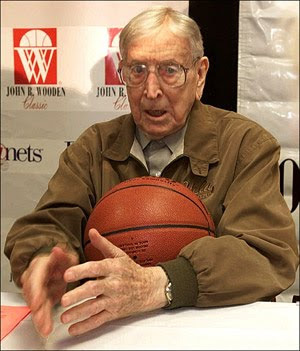 Here's another great article by Don Yeager who by the way just released a book on Coach Wooden ("A Game Plan for Life") that is a must read -- incredibly well written. 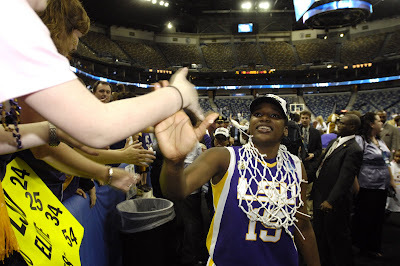 In this, another article, Don writes about the goal development stratgey for Coach Pat Summitt. can suffer. Hitting the smaller goals will get you closer to that pie-in-the-sky goal anyway. and help your teammates do the same. • Instill the idea of rewards for reaching goals,and consequences if you don’t. • Realize that others help you achieve your goal; no matter who makes the coaching decisions, nothing will get done without a strong team. • Commit your goals to writing. season, during a team meeting, Summitt asks her players what style of play they would prefer. Most often, each player wants to run and press—play hard, play fast, play smart. Then, when practice starts and her players are panting and sucking wind, Summitt is careful to remind them that this was the style they chose. players, the captains of the teams particularly, in setting some direction. If they are involved in setting the goals, establishing the rules and regulations, they’ll always be more cooperative. and she’ll be the first to tell you it was their hard work that led to all of her program’s accomplishments. Williams used his preseason time with players to reinforce his message and offer his prescription. “I reminded each player that the way you deal with expectations is to focus only on today,” he says. “Yes we have a plan for the entire year, but it all begins with what we are going to do today. If you work to be the best you can be today, you’re preparing yourself to be the best you can be tomorrow. It sounds simple, but it’s not. “If each of us works every day to be the best we can be on that day and then come back and do the same tomorrow, then we have a better chance of being our very best at year’s end. Will that be enough to win a national championship? That’s hard to say in college basketball today. One of the great things about life is that we can realistically be or do anything we choose to. This includes being a good time manager! We must believe that we can be a good time manager—that we have the potential. 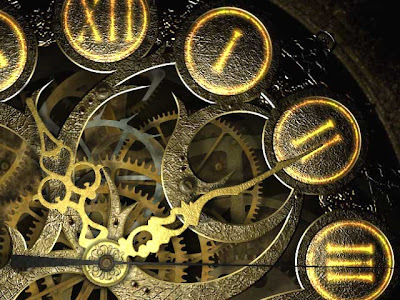 Unfortunately, many people say, “Well, I am just a poor time manager,” as if it were ingrained in their DNA. The truth is that anyone can be a great time manager, if they choose to go from potential to performance. 1. Believe that you can become a good time manager. 2. Inventory where your time is currently being spent. 4. 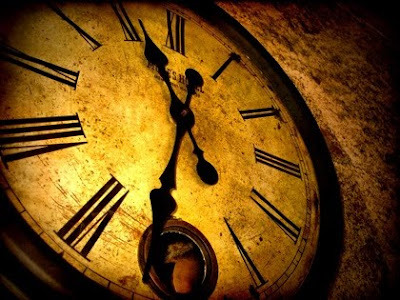 Set time priorities that will move you toward living out your values. 5. 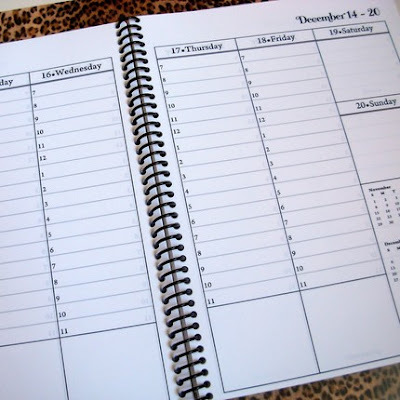 Develop a system of scheduling that works best for you, not a time-management conglomerate. 6. Learn to say no to things that are not part of your priorities moving you toward your values—exercise your power to choose. 7. Do what is in your new schedule. These simple steps, if you apply them, will take you from having the potential to be a good time manager to true time-management mastery and performance! Every person on the team was important. There were no exceptions. This included not only the last man on the team but also the student managers, who worked hard on our behalf. I told many business friends that if they wanted to hire a great employee, then choose one of our student managers. The would find a hardworking, self-starting, highly organized, dependable individual. Our players respected the student managers and didn't boss them around. Nor did they expect them to wait on them hand and foot. The players had a role; the managers had a role. One season I had to discipline a few players for behaving poorly toward the managers. I told them I wouldn't tolerate it happening again, and it didn't. WHAT DOES YOUR PROGRAM STAND FOR? The following comes from "Playing for Coach Meyer" by "Steve Smiley. It begs the question, what does your program stand for?! Janitor Dan was one of the janitors at Northern during my days on campus and he had actually been in some trouble with the law and was sent to prison. Knowing Dan on a personal level, it was tough to see somebody that I knew go to jail, but Coach Meyer made sure that everybody on the team still stayed in contact with Dan. As Coach states, “even though a person is in a bad situation, that doesn’t mean that we, as his friends, turn our back on him.” Coach Meyer had us set up a schedule where every player on the team wrote Dan letters while he was in jail. We had about fifteen guys on the team, so we created a schedule where guy had two assigned days each month to write a letter to Dan, and the numbers worked out where he would receive a letter from somebody basically every day. It was a great idea and for the most part we all stayed fairly consistent in writing Dan letters. In return, Dan would write Coach Meyer his own letters from time to time, and Coach would share those letters with us. Every time Dan wrote, it was clear in his letters that just reading whatever we had to say helped him get through the day. To impact somebody’s life and help them in a situation like Dan’s was a great feeling. Staying in touch with “Janitor Dan” was one of the greatest things we did as a program. you can never reach excellence." The level of people’s expectations has a great deal to do with the results they achieve. 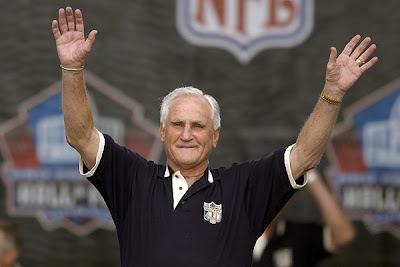 Don Shula’s vision of perfection for the football team he coached was to win every game. Was that possible? No, but the 1972 Miami Dolphins did it for a season—established a level of perfection that no other NFL team has ever matched. Don’s philosophy is that if you’re shooting at a target, you’re better off aiming at the bull’s-eye because if you miss it, the chances are high you’ll still be on the target. Some good things from Jim Rohn on stress management. And after a rough practice today I will be reviewing the list! Don't read into things so much. "Sometimes a look is just a look and a dirty coffee cup is just a dirty coffee cup. It's not a passive-aggressive way to say you are not appreciated," Fletcher says. Don't make things bigger than they need to be—with people or work. Some people make a project bigger than it needs to be in an effort to increase their own value, but they are increasing their own stress as a result. Learn how to transfer trust. "I really like Stephen M.R. Covey's stuff from his book Speed of Trust. He says people have to be able to trust before they feel it. Just like with your kids when you give them a little rope. And with someone who works for you, you have to let them fail because failure is feedback," Fletcher says. "Don't just say, 'It's easier to do myself.'" Recognize when you are being inefficient. "People who are stressed get stuck answering e-mails for two hours at the expense of higher value items that need to be taken care of, "Fletcher says. "Don't get lost in inefficient behavior. Ask yourself, 'What's my ultimate outcome I want here and what do I need to get there?'" Find an accountability partner to help you meet goals. "Choose a friend or a family member—probably not someone who lives with you because you don't want to muddy the waters. It has to be someone you will listen to but who will hold you accountable." "You have to say no to things you might enjoy, but you are not in line with where you are professionally or personally at the moment," Fletcher says. Then you can spend your time on what matters to you most. Sometimes you need to stay in touch but be out of reach. Learn how to say no. Don’t let your mouth overload your back. How do we talk to one another? My team has one rule regarding communication: when you talk to one another, you look each other in the eye. In our team’s prepation, there are three systems that I and my coaching staff try to instill. Of course, there is an offensive system and a defensive system consisting of basketball X’s and O’s, but there is also a communication system. 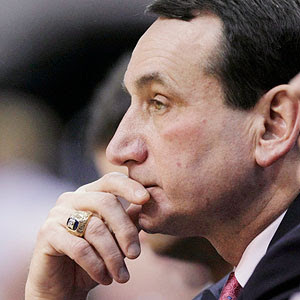 On our Duke Basketball teams, I never want to be the only communicator. In order for a message to get across, it must be echoed by every member of the group. "I learned from my players too. I never penciled in a starting lineup during our planning work in the summer. That would have been unfair to players who had worked hard in the off-season and improved. It’s amazing how much some young people can improve from one years to the next." Listening for FIGS: Four reasons for listening to any speaker or teacher. The reasons start with the letters F, I, G, and S.
Listen to Flatter: Flatter the speaker. But even if he doesn’t have anything of value for you, he’s still a human being. He would rather be flattered than ignored. Why not flatter him by keeping your eyes on him at all times? Not yet convinced? Listen to Impress: Impress the speaker. Send him away thinking and talking about what a terrific student you are. Listen to Get Ahead: Speakers, teacher—anyone—often can help you in ways you never imagine. Listen for Self-Discipline: If you think you can go through life always knowing who can help you and who can’t, who you should make an effort to flatter and impress and who you can afford to ignore and depress, you’re wrong. You’ll never do it. Sometimes the people who seem least in a position to help you are those who can do the most. Other times people who act like they can give you the world won’t actually life a finger for you. The intelligent thing to do, if you want to get ahead, is be the best you can be at all times, which brings us to self-discipline. You ought to learn to listen with your eyes and body—looking attentive and holding your body-erect—as a matter of developing your own self-discipline. Special thanks to Joey Burton at Mississippi State for tweeting this link on organizational accountability -- I think it is excellent! This is a passout for our staff and team tomorrow. The following six principles form the foundation for instilling accountability within your organization. Together they form a practical understanding of accountability, the transforming effect it can have on an organization, and its essential role in creating significant business results. 1. Accountability is a Statement of Personal Promise. Accountability is both a promise and an obligation to deliver specific, defined results. Accountability, as we define it, does not apply in an abstract way to departments, work groups, or entire organizations. Accountability applies to individuals and their personal promise that these functions will deliver the agreed results. Accountability is first and foremost a personal commitment to the organization and to those that the organization serves. 2. Accountability for Results Means Activities Aren't Enough. Everyone in an organization, from the CEO to the janitor, has some piece of the business and a corresponding set of results which are theirs to achieve. Distinguishing results from activities requires a shift in traditional thinking, built on an awareness of why we do what we do, and what activities we need to focus our attention on. 3. Accountability for Results Requires Room for Judgment and Decision Making. If you're not allowed to use any judgment or discretion on the job, if you're told to follow the rules no matter what, if no decision is up to you, then your boss can only hold you accountable for activities. You can be held accountable for doing what you're told, but you can't be held accountable for the outcome. 4. Accountability is Neither Shared nor Conditional. Accountability agreements are individual, unique, and personal strategies. No two people at the same level in an organization should have the exact same accountabilities. Separating each person's accountabilities can be challenging, but clarity results from the struggle to eliminate overlaps. 5. Accountability for the Organization as a Whole Belongs to Everyone. Every employee's first accountability is for thinking about and acting on what is best for the organization, even if doing so means putting aside one's individual, functional, or departmental priority. The most successful organizations expect and allow every person to be of practical assistance in realizing the organization's goals. 6. Accountability is Meaningless Without Consequences. In an accountability agreements, consequences need to be negotiated. Negotiated consequences that are personally significant to the employee in question are an essential element of accountability agreements and are fundamental to forging a fair deal. This is a key step in forging an interdependent and mutually beneficial relationship with one's employer. BOTTOMLINE: Organizational accountability eliminates the tendency to make excuses and shift blame. When employees make clear and specific commitments for their own work, entire organizations become aligned and achieve specific measurable results. "He loved sharpness. 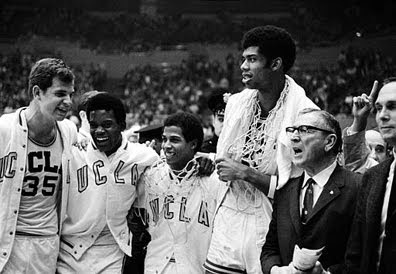 If Coach Wooden didn't see it in practice, that intensity of attention and execution -- the effort -- he might say very coldly, 'OK, we're through today. You didn't come here to work.' Marques Johnson or one of us would say, 'No, no, no. We'll get it going. C'mon, we'll get it going.' Almost pleading with him to give us another chance to work harder. Maybe his Midwestern upbringing, that lifestyle, put a love of hard work into him. Coach Wooden loved hard work. He wanted to see it from the players. If not, no yelling or screaming, he'd just threaten to end practice. And he wasn't afraid to follow through on the threat." The path to success consists of knowing your outcome, taking action, knowing what results you’re getting, and having the flexibility to change until you’re successful. The same is true of beliefs. You have to find the beliefs that support your outcome—the beliefs that get you where you want to go. 1. Belief #1: Everything happens for a reason and a purpose, and it serves us. 2. Belief #2: There is no such thing as failure. There are only results. • I’ve used the words “outcome” and “results” throughout this book because that’s what successful people see. They don’t see failure. They don’t believe in it. It doesn’t compute. • The super successes of our culture aren’t people who do not fail, but simply people who know that if they try something and it doesn’t give them what they want, they’ve had a learning experience. • Mark Twain once said, “There is no sadder sight than a young pessimist.” He’s right. People who believe in failure are almost guaranteed a mediocre existence. Failure is something that is just no perceived by people who achieve greatness. 3. Belief #3: Whatever happens, take responsibility. • Taking responsibility is in my opinion one of the best measures of a person’s power and maturity. • Those who take responsibility are in power. Those who avoid it are disempowered. 4. Belief #4: It’s not necessary to understand everything to be able to use everything. • Achievers invariably manage to be time misers. • Successful people are especially good at making distinctions between what is necessary for them to understand and what is not. • You can spend all your time studying the roots, or you can learn to pick the fruit. 5. Belief #5: People are your greatest resource. • Individuals of excellence—that is, people who produce outstanding results—almost universally have a tremendous sense of respect and appreciation for people. They have a sense of team, a sense of common purpose and unity. 6. Belief #6: Work is play. 7. Belief #7: There’s no abiding success without commitment. • Individuals who succeed have a belief in the power of commitment. If there’s a single belief that seems almost inseparable from success, it’s that there’s no great success without great commitment. • I like to use the term W.I.T.—Whatever It Takes. Successful people are willing to do whatever to takes to succeed. The following is by Chris Widener but was passed onto me from Sallie Guillory, the assistant women's basketball coach at McNeese State -- thanks Sallie! Some time ago, I spoke to a group of salespeople in Kansas City as they kicked off their new team. It was exciting to see them get excited about making a difference through their work. You can't get to the top if you don't think that there is a top or if you think you can't make it. One characteristic of those who reach the peak is that they always believe that things can get better or be done better. This pushes them on to be their best. They can see ahead of the pack. Their eyes aren't locked into the here and now. They see the bright future and what things will look like when they reach their destiny. While working hard for today, they live for the future! They do what Stephen Covey calls begin with the end in mind. The status quo is not for them. They want to be the best and experience the best. And that means giving their best. They go the extra mile so that in everything they do, in everything they say and think, they are striving for excellence. The Best have a Life Long Habit of Personal Growth. They don't want to stay at the level they are at. They want to grow in their work, their intellect, their spirituality, their relationships, and in every area of their life. And they discipline themselves to put themselves in situations wherein they grow. Personal growth doesn't "just happen." You choose to grow. I always suggest what Zig Ziglar does and that is to enroll in "Automobile University." Whenever you are driving around, listen to a personal or professional growth tape or CD. Over the long run you will grow. Also, read more. The old saying is true: Leaders are readers. So are those who pass the "Best" test. Like the lead runner in the race who has someone on his heels, the best know that the competition is right behind them. They love it though because they know that the competition keeps them from becoming lazy and resting on their laurels. Instead, the competition pushes them to go faster and to achieve more - to remain the best by forging ahead. Someone has to lead - it may as well be the best! Those who attain it get there because they want to. They want to lead and help make a difference. And they want to be equipped with the skills necessary to lead others on to a better place. They aren't in it just for themselves, though they will surely reap the rewards of being the best. Rather, the build things that last beyond themselves, things that can be enjoyed by others as well. Just like weight loss boils down to eat right and exercise, personal management boils down to prioritize and execute. First, prioritize your activities. The important stuff goes on the top. Then, execute: do them. The best have habits and discipline that get them to the top by doing the best things and doing them first. Success does not come alone. Everyone who achieves much does it with the help of countless others. How do the Best get others to help them? They treat them right. They embrace them and help them. People become the best because they help other people, and people like them. When they fail they admit it and move on. They get back up and do it right the next time. They let their actions speak loader than their words. They stand tall and do the right thing the next time. No excuses, just results. The Best Understand that the Good is the Enemy of the Best. Yes, they could say, "this is good." But that would mean they have settled for less than the best. Many people think that good is good. Good is not good. Good is the enemy because it keeps us from the best. Choose your side: the good or the best. The Best choose, you guessed it, the Best. The Best Dare to Dream. While others live the mundane and settle into a life they never bargained for, a rut, the Best dream of a better life. And then they take the risks necessary to achieve their dreams. They live by Teddy Roosevelt's quote: Far better it is to dare mighty things, to win glorious triumphs though checkered by failure, then to rank with those poor spirits who neither enjoy nor suffer much because they live in the grey twilit that knows neither victory nor defeat. Want to be the best at what you do? Take inventory on the above characteristics and then start moving to bring your life in line with the characteristics of the "best." Then when you get to the top you will know that you have passed the "Best" test. 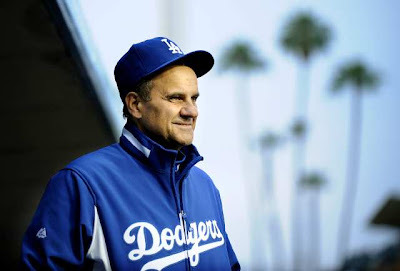 Joe Torre’s Triple Play includes fairness, respect and trust. These are the three prime ingredients in any recipe for teamwork. 1. I treat team players with honesty and trust, and ask for the same in return. 3. I apply team rules evenhandedly to all team members. 4. I never give grievances to others, including the media, before I privately air my grievance with a player. "Success is an everyday proposition. It isn’t defined by a championship game or the day you get your diploma, get drafted by an NFL team, make the big sale, land the account of a lifetime, or get your law degree. But the key to a successful life is in the journey and the process. 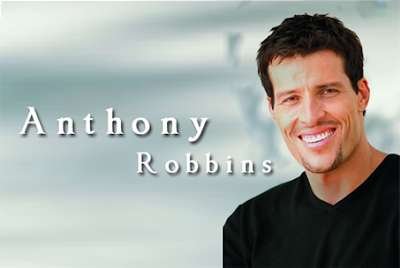 It’s that emphasis on the journey to success that we work on each day, step by step." 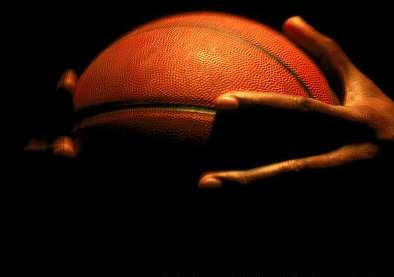 "The most important thing the player must be taught in holding the basketball is that the palms of the hands should never touch the ball. The ball must be held with the fingers spread comfortably but as widely as possible." "The man with the ball must also be reading the man playing him. We feel that an extended leg by the defensive man is a direction in which we have a pretty good chance of driving. We think it is much easier to drive the extended leg than the leg that is set back away from the offensive man." "We want any player receiving the ball at any position on the court to immediately face the basket for a two count…the two count enables everybody on the floor, including the man with the ball to do a much better job of reading the defense." This comes from Jim Rohn Weekly Ezine. Try to think of coaches who fit these characteristics. If you are fortunate enough, you've had some players who also fit this mold. It's interesting but I've been spending some time this week working with Temeka Johnson and her foundation and she was a player for us who understood all these qualities. 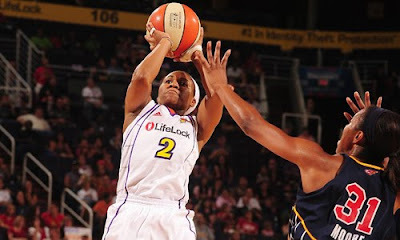 She obviously still lives them which is why she was able to help her Phoenix Mercury to a WNBA title this year. If you want to be a leader who attracts quality people, the key is to become a person of quality yourself. Leadership is the ability to attract someone to the gifts, skills and opportunities you offer as an owner, as a manager, as a parent. I call leadership the great challenge of life. 1) Learn to be strong but not rude. It is an extra step you must take to become a powerful, capable leader with a wide range of reach. Some people mistake rudeness for strength. It’s not even a good substitute. 2) Learn to be kind but not weak. We must not mistake kindness for weakness. Kindness isn’t weak. Kindness is a certain type of strength. We must be kind enough to tell somebody the truth. We must be kind enough and considerate enough to lay it on the line. We must be kind enough to tell it like it is and not deal in delusion. 3) Learn to be bold but not a bully. It takes boldness to win the day. To build your influence, you’ve got to walk in front of your group. You’ve got to be willing to take the first arrow, tackle the first problem, discover the first sign of trouble. 4) You’ve got to learn to be humble, but not timid. You can’t get to the high life by being timid. Some people mistake timidity for humility. Humility is almost a God-like word. A sense of awe. A sense of wonder. An awareness of the human soul and spirit. An understanding that there is something unique about the human drama versus the rest of life. Humility is a grasp of the distance between us and the stars, yet having the feeling that we’re part of the stars. So humility is a virtue; but timidity is a disease. Timidity is an affliction. It can be cured, but it is a problem. 5) Be proud but not arrogant. It takes pride to win the day. It takes pride to build your ambition. It takes pride in community. It takes pride in cause, in accomplishment. But the key to becoming a good leader is being proud without being arrogant. In fact I believe the worst kind of arrogance is arrogance from ignorance. It’s when you don’t know that you don’t know. Now that kind of arrogance is intolerable. If someone is smart and arrogant, we can tolerate that. But if someone is ignorant and arrogant, that’s just too much to take. 6) Develop humor without folly. That’s important for a leader. In leadership, we learn that it’s okay to be witty, but not silly. It’s okay to be fun, but not foolish. Lastly, deal in realities. Deal in truth. Save yourself the agony. Just accept life like it is. Life is unique. Some people call it tragic, but I’d like to think it’s unique. The whole drama of life is unique. It’s fascinating. And I’ve found that the skills that work well for one leader may not work at all for another. But the fundamental skills of leadership can be adapted to work well for just about everyone: at work, in the community and at home. The following comes from Coach Eric Musselman. 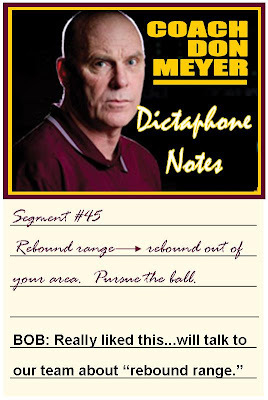 It is something we made a passout for our team and I've posted it on our player's blog Hoop Boost as well. Personal Accountability - Successful teams, one common characteristic very clearly. Every one of these teams has a person or people who hold themselves personally accountable. 1. Don't blame others first; instead, they look first for what they contributed (or did not contribute) to the situation. 2. Don't complain; instead, they look for ways to correct things that aren't working* don't procrastinate; instead, get things done now. 3. Always give more than they ask of others. 4. Always look to take on as much as they can handle, rather than look to pass things on to others all the time. 5. Are constantly trying to improve their game so they can bring more to the team and consistently fulfill their role. 6. Are self starters and study the game (and themselves) enough to know what needs to be done; then go about doing it. 7. Do the unrequired work, knowing that it simply needs to get done -- extra shots, extra weight training, extra film watching, etc. 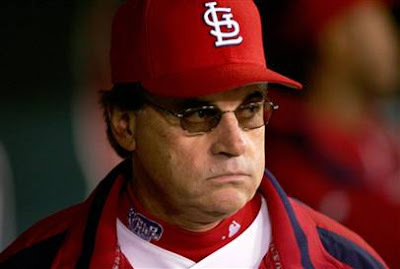 - without constantly needing a coach to tell them to work. 8. Hold others accountable for their jobs and roles because they know the importance of accountability as it relates to winning; this creates a collective responsibility. 9. 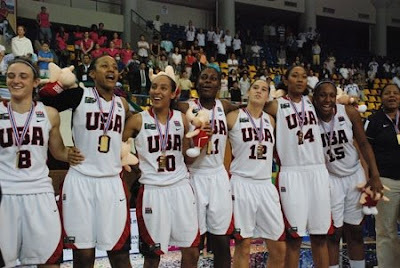 Always be among of the most trusted players on the team, by coaches and players. There is never enough time to do everything but there is always enough time to do the most important things. When you find yourself under pressure to get a job done by a particular deadline, you are forced to be vastly more efficient than you would ever be if you felt that you had ample time. This explains why so many people get the job done only when they are faced with stringent deadlines. Parkinson's Law says, “Work expands to fill the time allotted for it.” If you have two hours of work to do and an entire day in which to do it, the work will tend to expand gradually, and will take you all day long to complete the two hours of work. However, the reverse is also true. It is “Work contracts to fill the time allotted for it.” Use this law by setting deadlines for yourself that force you to complete the task far sooner. Continually analyze your work and focus your attention on completing your most important task, the task that represents the most valuable contribution you can make, on schedule, if not before. 1. What are my highest value activities? What are the things that I do that contribute the greatest amount of value to my work? 2. What are my key result areas? What are the specific results that I have been hired to accomplish? 3. Why am I on the payroll? Why do they pay me money at my job? What specifically have I been asked to do? 4. What can I, and only I, do that, if done well, will make a real difference? If I don't do it, it won't get done. But if I do it, and I do it well, it will make a significant contribution to my work and my life. What is it? There is usually only one activity that represents the highest and best use of your time. Your job is to identify it and then to throw your whole heart into getting it done quickly and well. Create your own “forcing system.” Set specific deadlines for yourself and then resolve to get the job done well ahead of schedule. It’s more important as a manager to be respected than to be popular. 1. Think back to a leader you had—a parent, teacher, coach, or boss who got great performance from you. More than likely, this was a leader who combined tough and nice. You knew that person cared about you, but that he or she would not let up on you in the quest for excellence. 2. If you, as a leader, demand that your people add value to the organization through their work, you must fulfill you end of the bargain by telling the truth and keeping work standards high. This often means sacrificing popularity in your endeavor to do the right thing. 3. Are you willing to push your people—whether it’s a group of middle managers or a Cub Scout pack—beyond their comfort zone in order to achieve excellence? They might not like what you ask of them, but they will remember you as a leader they respected. jump-shooting offense. Get the ball inside via post ups, cutting and driving. reversals? Be sure to watch game tape to examine if you are. non-shooters are looking for shooters to screen for. I got my hands on a new book this past week, "Game Strategies and Tactics for Basketball" from my friend Kevin Sivils. 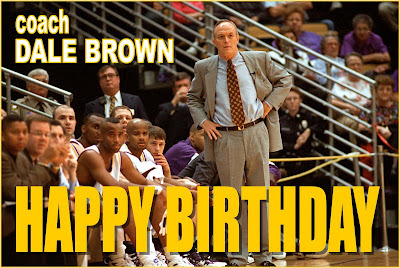 I first met Kevin as an assistant on Dale Brown's staff and immediately recognized a passion on his part to TEACH -- which is why I am not surprised that his book is an excellent one. 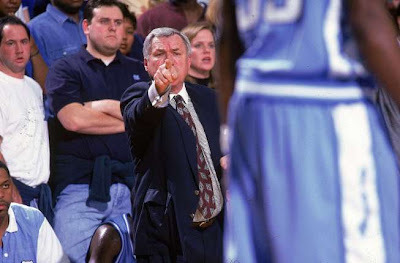 It speaks to theories Kevin learned from Coach Wooden and Don Meyer as well as understanding what you can control from the bench and what you cannot -- including your relationship with officials. Again, this is game coaching that we often don't give enough thought to such as preparing to play at home and on the road, bench decorum and bench organization. A different look at defense with thoughts on how to foul for profits, special defensive strategies and how and when to change defenses. How Fast Do You Want to Play? Kevin talks about how to speed the game up and how to slow the game down. This is a section on understanding time and score, killing the clock and what do you need to do to comeback in a game. A lot of great checklists to help your stay organized in a variety of areas. Coaches should always be thinking about teaching the game, and regardless of the outcome of the game, never stop coaching and teaching the players! The time to plan for special situations and bench coaching strategy and tactics is long before the game. The coach should decide what to do before games so decisions will be made in a calm, unemotional environment. The coach's responsibility is to TEACH the players. If ever there was a creed or slogan that every coach in every sport should adopt, this might be the one. 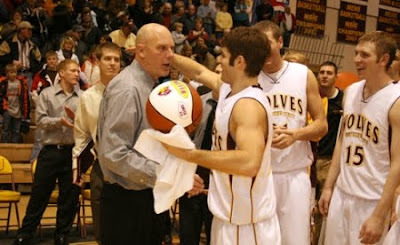 All players must accept responsibility for their actions, their inactions, and their individual responsibilities. It is almost inbred in each of us as humans to resist these very things; thus, the need for coaches everywhere is to teach the Wooden Rule. Whining simply produces negativity and annoys other people. No one likes to be around a "whiner." It is not good for the player, it is not good for the team, and it does not foster a positive team environment. It can also be like a contagious virus. If one player whines unchecked long enough, the whining can spread like the contagious virus. 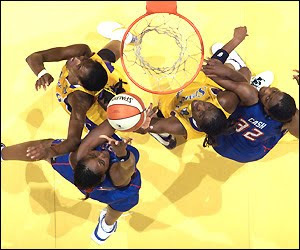 Whining also prevents a player from being proactive and taking steps to eliminate the very thing that he or she is whining about, preventing the player from living up to his or her potential. 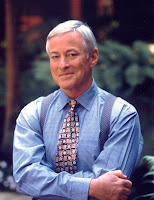 From my Brian Tracy email newsletter comes his five ingredients for Managing and Motivating. I've had some coaching thoughts on how Brian's thoughts would pertain to practice at the end of each ingredient in purple. Thousands of employees were interviewed about what they considered to be a “great place to work.” The answers they gave were different from what the managers expected. The first ingredient of a good job was "challenging, interesting work." This is work that kept the employee busy and involved all day long. I think this is a great concept for practice. Whether you are practicing for 90 minutes or two and half hours (as we did both today). We want our practice to be challenging but we must be careful not to make it monotonous and boring with a lack of variety in our repetition. The second ingredient was a feeling of being “in the know.” A good job was defined as one where the employee felt that he or she was fully informed on what was happening in the company. The employee felt like an insider, like an important part of a larger group. We think it is very important that we not only tell our team "what" and "how" to do things but "why." It is the why that leads to better execution. Video sessions and chalk talks also help to get that feeling of being "in the know." The third ingredient of a great place to work was a “high trust” environment. This was defined as a job where a person could feel free to do his or her best and to make mistakes, without being criticized or fired. When employees felt that they were free to make mistakes with no punishment or hostility, they enjoyed their work much more, became more creative, and worked more effectively with other people. There is not question that when a team trusts a coaching staff that their practice performance will be much better. That trust factor comes from our ability to be extremely prepared. We must meet about practice and talk about the essentials. Before we can demand execution of our team, we must first demand it of ourselves in the way we run our practice. The fourth ingredient in a good job was a caring boss and friendly co-workers. Often, the human environment was more important than anything else. People like to work in a place where they get along well with everyone. The happier they felt their work relationships, the better they worked, the lower the level of absenteeism was, and the more productive they were. We've all heard it, "They won't care how much you know until they know how much you care." Your ability to care about your players will make a tremendous difference in how they see and hear what you say. The fifth ingredient for a good job turned out to be good pay and opportunities for promotion and advancement. To the surprise of many managers, the issue, of pay was number five among factors that constituted a good job or a great place to work. Psychologists have found that a certain level of pay is essential for people to feel comfortable with their jobs, but above that level, it does not have much motivational impact. It is only when pay is sub-standard or below what would normally be expected for such a job that it becomes a de-motivating influence. I think this equates to starting and practice time but it also means a visible appreciation by our staff for individual and team efforts at practice. Whether we acknowledge a player in front of the team, to our fans or the media, it's important that recognition comes with positive performance. Making sure they have the best gear available. Is your locker room as nice as it can be? Treat you team well and it sends a message.